At John Battelle’s NewCo event last week, I had the opportunity to meet a founder of a FinTech startup seeking to revolutionize payments in Mexico. After spending time with team at Clip, I decided to write on a few FinTech startups focused on Spanish-speaking and LatAm markets. Rather than go into detail on Clip’s story, read the PandoDaily article on them for a recap of its business model and history. In a nutshell, Clip is looking to be Square for Mexico, a market where cash dominates, merchants keep multiple card reader for different banks – and where credit is often as scarce as finding good customer service, according to Clip. 60% of the Mexican market (over 75 million people) is considered unbanked: Many line up to cash paychecks; cards are not as prevalent with consumers or merchants. Clip is trying to disrupt the market with technology, superior on UX, and through exceptional customer service. I’d lower its reader price to compete with Sr. Pago, but I found Clip’s goal to deliver “customer happiness” vs. Comcast-like service found at Mexican banks was a compelling vision. Their energy and passion for the SMB and bringing change to banking in Mexico was inspiring. They could, if successful, achieve a double bottom line impact in Mexico and Latin America – a topic on my mind after last week’s CFSI Emerge event. Beyond Sr. Pago and Clip, startup iZettle (which does business in Mexico today) is looking to grow across Latin America (bypassing the US market, which it sees as too competitive). It recently rolled out a low-cost card reader for Apple Pay. Another startup, Klarna, is targeting the Latin American market: It just announced the hiring of an executive from American Express to lead growth efforts, noting he had led business development for Latin America. Klarna, unlike iZettle, is also targeting the US market. I spoke this week to another innovator in the Spanish FinTech category, Sergio Chalbaud, CEO of Fintonic, a startup founded in the wake of the financial crisis in Spain, whose PFM application has a 70% market share in Spain. Fintonic aims to be more than a PFM solution. Rather, the goal is to be a “bank of banks” and help consumers meet their financial goals. Fintonic offers a lending and insurance centric mobile solution that “goes beyond a traditional PFM using, using proprietary algorithms and data” said Chalbaud. The aim is to reduce the hassles of entering data and provide better transparency and terms for consumers. After success in Spain, Fintonic is expanding to Mexico and Chile. Simple, the online bank that was acquired by BBVA in early 2014 is yet another example of the marketplace involvement of Spanish banks in FinTech. Simple won praise for its product usability, elegance and corporate culture that was unlike that of a bank. Dave McClure of 500 Startups backed Simple in 2010. Although Simple gained just 100k customers in the US, never earned a profit or – a critical show stopper – obtained a banking license, it inspired a lot of admiration. In fact, as the NY Times reported the chairman of BBVA, Francisco González, was intrigued by its co-founder criticizing banks’ technology and service. González wrote a letter to Simple’s founders that later led to BBVA buying Simple. Another Spanish connection to the FinTech world is the role of Banco Santander, a well-run and acquisitive Spanish bank known for its global expansion under former CEO, Emilio Botín. Having advised Abbey National, a large building society in the UK (similar to a savings and loan) later acquired by Santander, I’ve followed its global growth. It’s worth noting that FinTech thought leader, Bradley Leimer, is Santander Bank USA’s Head of Innovation. Santander made news last year when it set up Santander InnoVentures. Its $100 million fund in 2014 will help the bank get closer to the wave of disruptive innovation. Another great FinTech story in this market is Oportun, formerly known as Progresso Financiero. The startup bank is run by Raul Vazquez, the former global head of e-commerce for WalMart, and widely admired business leader. Providing affordable loans for the Hispanic community, it’s a new style bank with a tech-like culture and amazing customer service. Backed by FinTech venture capital firm, CoreVC, Oportun is expected to IPO in 2015-6. For more information about FinTech and innovation in the Spanish-speaking and Latin American markets, I’d suggest looking at Finnovista, an organization that is 100% focused on innovation in financial services for Spanish-speaking markets. I’m hoping that I’ll collaborate with Finnovista in the future, so watch for updates on this. 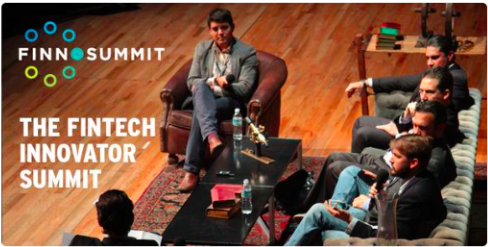 Look into Finnosummit, its annual event taking place in Mexico City in September. Posted on June 19, 2015 June 19, 2015 by Michael Halloran	This entry was posted in Uncategorized and tagged Ciip, Finnovista, Fintonic, iZettle, Klarna, Oportun, Santander, Sr. Pago. Bookmark the permalink.